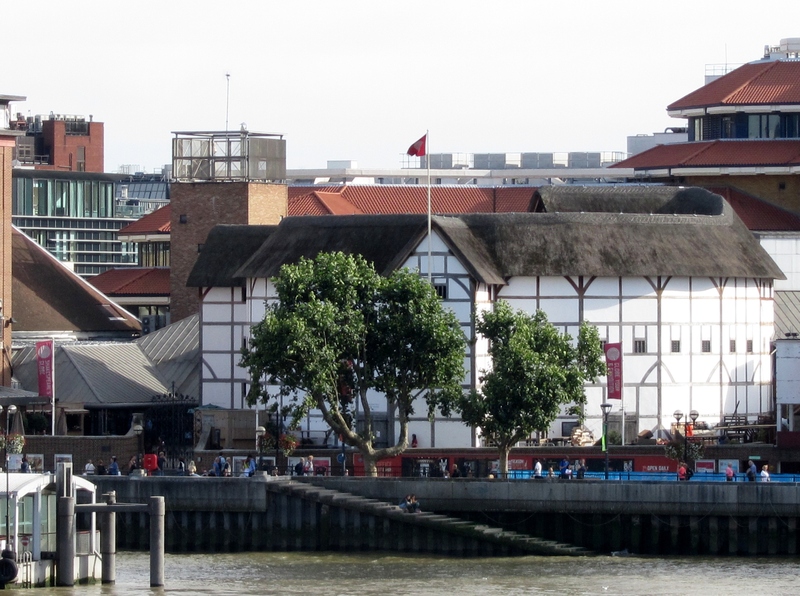 Shakespeare’s Globe Theatre was at the top of our list of fascinating places to visit in London. Tickets in hand to a performance of The Taming of the Shrew, we successfully navigate the tube (subway) and then walk over the Thames River along the Millennium Bridge to the theatre (English spelling). Prior to the performance we join a “setting the scene” lecture by Professor Sandra Clark of the University of London. She is not a riveting speaker, but we still learn a good deal about the play, known as a farce, and the current perspectives of critics and scholars. Two actors from the company are present and give impressive, suitably Shakespearean readings, which everyone enjoys. I ponder whether this was the best play to choose for our first experience at the Globe… a sexist, misogynist, unpleasant story, she says. Most critics today don’t like it, given that it’s about “unruly” wives being disciplined by husbands. Dr. Clark gives an honest portrayal of the dark side of the play, such as starvation and brainwashing, but also helpfully offers up some contrasting thoughts about how the main characters, Petruchio and Katherina, both rise through pain to transformation. Later I decide that whatever pain Petruchio experiences, Katherina, his reluctant new wife, definitely gets the worst of the deal. We troop off down flights of stairs and across cobblestones to the theatre. 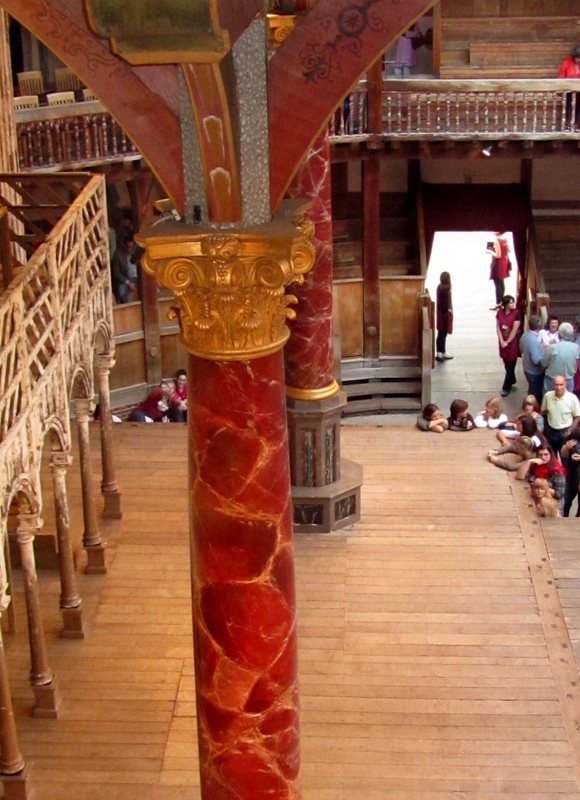 When we arrive at our seats, we come to understand just how faithfully its reconstruction followed Elizabethan architecture. The benches were built for the smaller people of that time and, even though we rent cushions, they are truly uncomfortable. My better half has a difficult time fitting his six-foot, sturdy frame into the allotted space. (More on this later.) We look around and see that, like much of London, the crowds of people surrounding us are mostly young, animated and far more limber. (More on nimble audiences in a moment.) 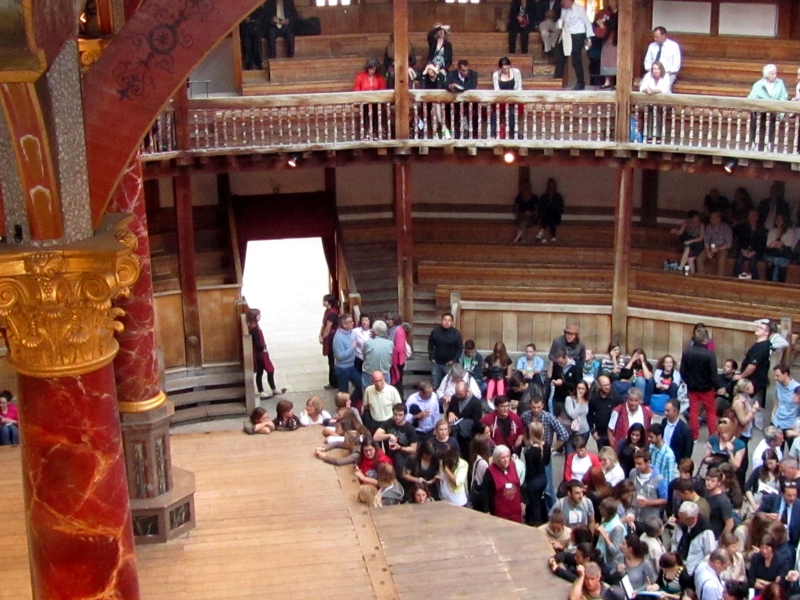 We look down and see that a large space in front of the stage is open for the audience to stand, many leaning on the stage as the play begins. The actors flow onto the stage, but also suddenly appear in the standing audience, which is a big hit. I am in for several surprises as the performance unfolds. Petruchio, the less-than-savory suitor seeking a rich bride, stumbles loudly and drunkenly through the audience, wobbles onto the stage and then proceeds to urinate in a wide arc on the stage. While I cannot tell if this is an absolute true-to-life rendition of the act, I am repulsed when some of the liquid flings into the audience. A man in the audience yells out and takes off running through the crowd shaking his head. (Hence the need to be nimble.) Petruchio then falls over and spits out liquid in another wide arc, this time soaking a young woman in the front. Ugh! I have read that the Elizabethan audiences were earthy – especially those in the standing area – and I know that these plays are intended to be ribald, yet this is disgusting. The acting is great and voice projection is amazing – we are three levels up and can hear the dialogue. However, it is fast-paced and accented so we miss some of the humor. I had not read the play for some years and had forgotten just how bawdy it was, with plenty of sexual innuendo and casual banter about women as property. Katherina and her sister, Bianca, engage in a physical fight that leaves me wondering how many bruises the actors collect in each performance. With the amount of movement on a very small stage I also wonder how the actors avoid falling off into the audience. All the world’s a stage … and it’s small! The actors occasionally engage the audience near the stage in dialogue, which is well received. When an airplane flies over – a regular background noise in London – they manage to build that into their performance. They really are terrific. Katherina’s wedding scene is disturbing, with Petruchio turning up in little more than a codpiece. While she is not a likeable character, I feel her humiliation. By this time, my husband’s knees have been jammed up for too long. Neither of us can really move our legs and my non-limber hips are screaming for relief. We head downstairs and hang out at the back of the standing audience area, which is fun. Onstage, the “shrew” Katherina is now being treated abysmally by her new husband Petruchio and his house staff, as part of the “taming.” I have had enough. Yes, it’s a farce from centuries ago, but I don’t like it. We walk through a dark, quiet waterfront area to the tube, chatting about our experience. All in all, we are pleased we came – it was a rich sensory experience. 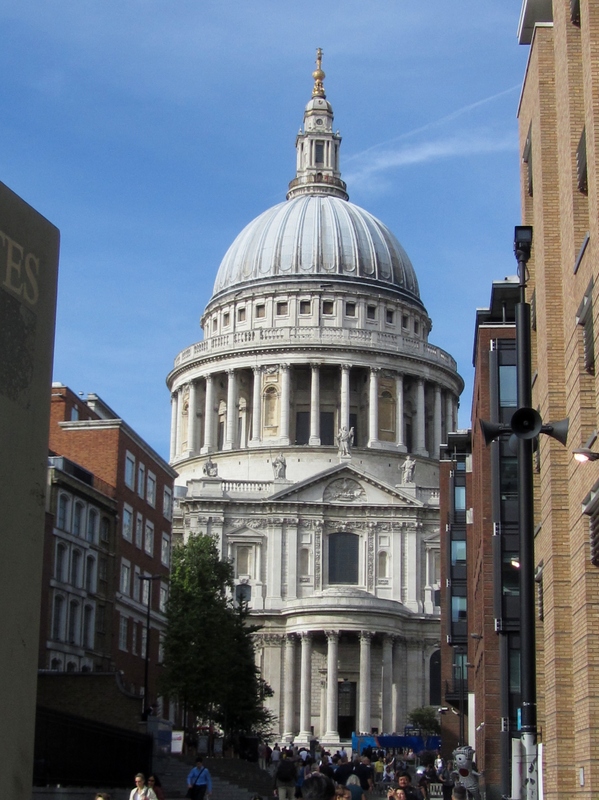 London has given us an abundance of memories to contemplate and revisit.